Make sure you ask for the retailer’s parking bay number as part of the transaction, so you can deliver produce to the correct location. Produce can only be delivered to the ‘loading zone’ next to the parking bay – not the space for the vehicle. Produce can be delivered to the rear of light commercial vehicle parking bays. Look at a map, or use the Melbourne Market Navigator app to work out your route before delivering produce to the retailer. Electric vehicles are permitted to park on the edge of the carriageway clear of the pedestrian paths. 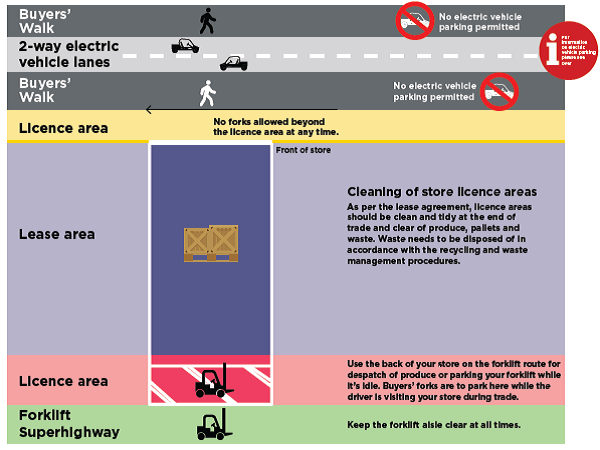 Electric vehicles are not to park within pedestrian paths and must keep clear at all times. Vehicles must not park in the centre of the Buyers’ Walk.